Have you ever wanted to hot rod an Arp Solina String Ensemble? Now you can. 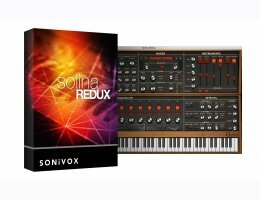 SONiVOX’s Solina Redux virtual instrument adds a sweet sounding virtual analog synthesizer to a classic reproduction of an Arp Solina String Ensemble, then throws in TWO fully programmable 8-step sequencers to boot. It’s a match made in heaven and one that produces sonic textures you simply can’t get any other way. The Arp Solina was the preeminent string ensemble in the 1970’s, made famous by the Eagles, Elton John, Pink Floyd, The Cure, Joy Division, Tangerine Dream, New Order and many others. Its analog Violin, Viola, Cello, Contra Bass, Trumpet and Horn sounds have a sound that creates rich retro sounding orchestral ensembles, especially with its famous "Ensemble" chorus effect. Solina Redux gives you access to the original Solina sounds, including a model of the Ensemble chorus effect, but includes a modern virtual analog synthesizer as a sidecar. The combination of these two synthesizers provides a sound palette that is both retro and modern or anything in between at your discretion. Each synth includes a multi-mode filter, amplitude and filter envelopes, LFO modulations and send effects. To top it off, Solina Redux adds in two fully programmable step sequencers, one for the Solina instrument and one for the analog synthesizer. Play one note and out comes a modern orchestra unlike any you’ve heard. Each step sequencer gives you per step control over the pitch of each note, the volume of each note, the filter cutoff of each note, and the panning of each note. Other controls include gate time, tempo sync, time division, swing, note order and octave shift.